Here it is! Totally updated in 2006-2008 to perfection in one of the most convenient locations in the S.W. 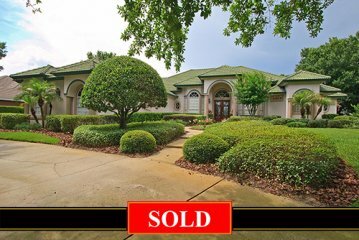 Orlando Area – near restaurants, sidewalk cafes, more shopping and restaurants that you can imagine! Leave the security and privacy of the impressive gated community, and you will arrive at all of Disney attractions in only 15 minutes. The rear of the home overlooks open space. Swim all year long – the Pool is heated and has an adjoining spa with jets overflowing into the Pool. 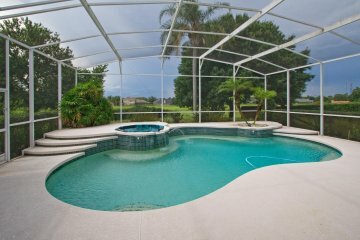 Pool and spa are in a screen enclosure! Step outside the screen enclosure and you will find an outdoor grilling area set on a stone patio. Florida living at its finest! One enters this beautifully appointed home through a leaded glass door entry which opens to an open floor plan accented by rich hardwood flooring and detailed ceilings throughout. 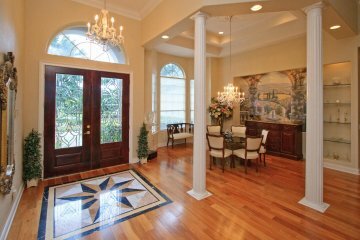 This 5 bedroom home is well priced and boasts updated elements of the finest quality! 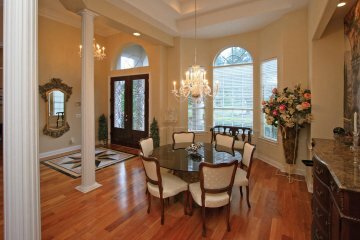 Stately columns define the formal areas. A fabulous Kitchen opens to an expanded Family Room and offers all the features desired by a gourmet chef, such as Advantiuim 220 watt oven that cooks with light and heat, a convection/regular oven, warming drawer, 5 burner cook top with sensors, 48” refrigerator/freezer, dishwasher, vent hood with halogen light and fan, Amendion exotic wood flooring, a 65” center food-prep island, oversized sink, an abundance of cabinet storage topped with Blue Pearl granite- truly a gourmet’s dream! 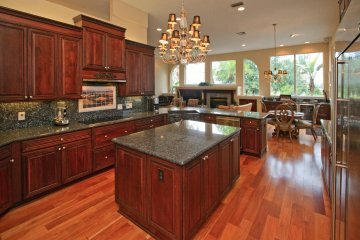 The Kitchen opens to a grand 31’ Family Room complete with Entertainment Center, a long Refreshment Area with granite top, wet bar and Cherry cabinets! Glass doors lead from the Family Room out to the screen enclosed outdoor entertainment area with heated Pool and Spa. 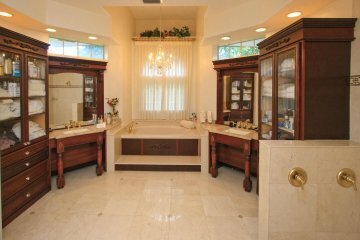 The Master bedroom, which features 2 closets (one of which is 13’ long), adjoins a luxurious Bath accented with marble flooring, cherry cabinets and an abundance of storage! All bathrooms are completely updated! 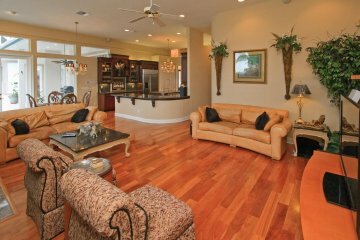 Other special features of this beautiful home include a Central Vacuum system, Mirage Omni surround system speakers, 3-car Garage, and lighted niches for decorative pieces. The community, “Balmoral” is an intimate enclave of 32 custom homes with an impressive gated entrance, designed for a wonderful family lifestyle with a community Tennis Court and access to top-rated schools. This is an outstanding opportunity in one of the most convenient areas of S.W. Orange County in Windermere.